Common wheat (Triticum aestivum), also known as bread wheat, is a cultivated wheat species. 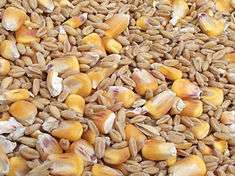 About 95% of the wheat produced is common wheat, which is the most widely grown of all crops, and the cereal with the highest monetary yield. 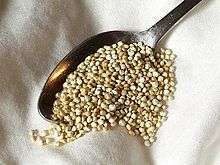 Numerous forms of wheat have evolved under human selection. This diversity has led to confusion in the naming of wheats, with names based on both genetic and morphological characteristics. For more information, see the taxonomy of wheat. 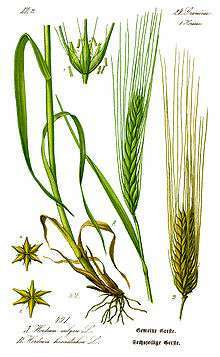 Bread wheat is an allohexaploid (an allopolyploid with six sets of chromosomes: two sets from each of three different species). 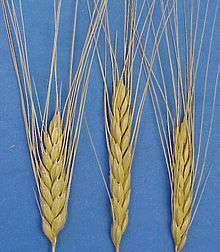 Of the six sets of chromosomes, two come from Triticum urartu (einkorn wheat) and two from Aegilops speltoides. 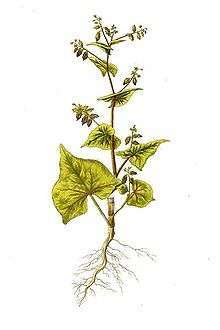 This hybridisation created the species Triticum turgidum (durum wheat) 5800–8200 years ago. The last two sets of chromosomes came from wild goat-grass Aegilops tauschii 2300–4300 years ago. 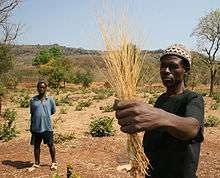 Free-threshing wheat is closely related to spelt. 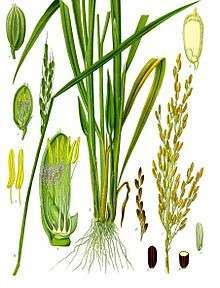 As with spelt, genes contributed from Aegilops tauschii give bread wheat greater cold hardiness than most wheats, and it is cultivated throughout the world's temperate regions. Common wheat was first domesticated in Western Asia during the early Holocene, and spread from there to North Africa, Europe and East Asia in the prehistoric period. Wheat first reached North America with Spanish missions in the 16th century, but North America's role as a major exporter of grain dates from the colonization of the prairies in the 1870s. As grain exports from Russia ceased in the First World War, grain production in Kansas doubled. 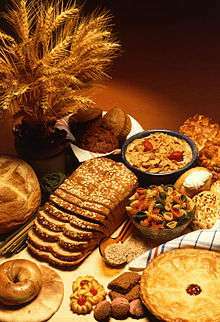 Worldwide, bread wheat has proved well adapted to modern industrial baking, and has displaced many of the other wheat, barley, and rye species that were once commonly used for bread making, particularly in Europe. 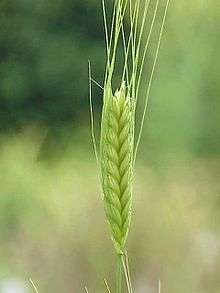 Modern wheat varieties have short stems, the result of RHt dwarfing genes  that reduce the plant's sensitivity to gibberellic acid, a plant hormone that lengthens cells. 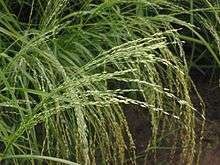 RHt genes were introduced to modern wheat varieties in the 1960s by Norman Borlaug from Norin 10 cultivars of wheat grown in Japan. 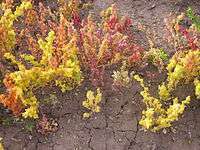 Short stems are important because the application of high levels of chemical fertilizers would otherwise cause the stems to grow too high, resulting in lodging (collapse of the stems). 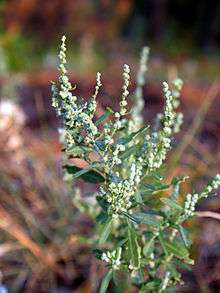 Stem heights are also even, which is important for modern harvesting techniques. 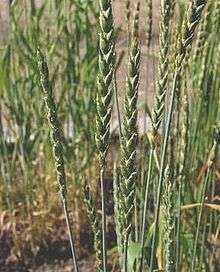 Compact wheats (e.g., club wheat Triticum compactum, but in India T. sphaerococcum) are closely related to common wheat, but have a much more compact ear. Their shorter rachis segments lead to spikelets packed closer together. Compact wheats are often regarded as subspecies rather than species in their own right (thus T. aestivum subsp. compactum). ↑ Brenchley, R; Spannagl, M.; Pfeifer, M.; Barker, G. L.; d'Amore, R.; Allen, A. M.; McKenzie, N.; Kramer, M.; Kerhornou, A.; Bolser, D.; Kay, S.; Waite, D.; Trick, M.; Bancroft, I.; Gu, Y.; Huo, N.; Luo, M. C.; Sehgal, S.; Gill, B.; Kianian, S.; Anderson, O.; Kersey, P.; Dvorak, J.; McCombie, W. R.; Hall, A.; Mayer, K. F.; Edwards, K. J.; Bevan, M. W.; Hall, N. (2012). "Analysis of the bread wheat genome using whole-genome shotgun sequencing". Nature. 491 (7426): 705–10. doi:10.1038/nature11650. PMC 3510651 . PMID 23192148. ↑ Bonjean, Alain P. and William J. Angus (eds) (2001). The world wheat book : a history of wheat breeding. Andover: Intercept. p. 1131. ISBN 1-898298-72-6. Excellent resource for 20th century plant breeding. ↑ Caligari, P.D.S. and P.E. Brandham (eds) (2001). Wheat taxonomy : the legacy of John Percival. London: Linnean Society, Linnean Special Issue 3. p. 190. ↑ Heyne, E.G. (ed.) (1987). Wheat and wheat improvement. Madison, Wis.: American Society of Agronomy. p. 765. ISBN 0-89118-091-5. ↑ Zohary, Daniel and Maria Hopf (2000). 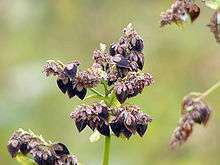 Domestication of Old World plants: the origin and spread of cultivated plants in West Asia. Oxford: Oxford University Press. p. 316. ISBN 0-19-850356-3. Standard reference for evolution and early history. 1 2 Mayer, K. F. X. (2014). "A chromosome-based draft sequence of the hexaploid bread wheat (Triticum aestivum) genome". Science. 345 (6194): 1251788. doi:10.1126/science.1251788. 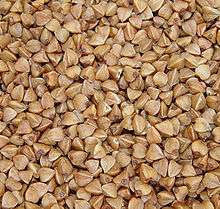 ↑ "Triticum aestivum (bread wheat)". Kew Gardens. Retrieved 1 October 2016. 1 2 Sanità Di Toppi, L.; Castagna, A.; Andreozzi, E.; Careri, M.; Predieri, G.; Vurro, E.; Ranieri, A. (2009). 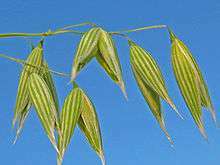 "Occurrence of different inter-varietal and inter-organ defence strategies towards supra-optimal zinc concentrations in two cultivars of Triticum aestivum L". 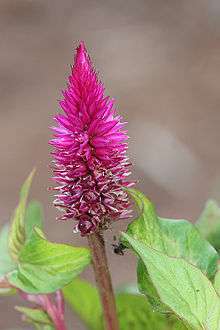 Environmental and Experimental Botany. 66 (2): 220. doi:10.1016/j.envexpbot.2009.02.008. ↑ Marcussen, T. (2014). "Ancient hybridizations among the ancestral genomes of bread wheat". Science. 345 (6194): 1250092. doi:10.1126/science.1250092. ↑ m., E.; w., S.; k., G.; g., R.; r., R. (2002). ""Perfect" markers for the Rht-B1b and Rht-D1b dwarfing genes in wheat". TAG Theoretical and Applied Genetics. 105 (6–7): 1038. doi:10.1007/s00122-002-1048-4.